This past weekend I went camping on the beach with my roommates. I almost didn't go. I wanted to work on my book and thought a quiet house without distractions would be the best place to do it. But, it was sunny and I had a new tent to break in, and what kind of idiot passes up the chance to camp on the beach in Thailand? 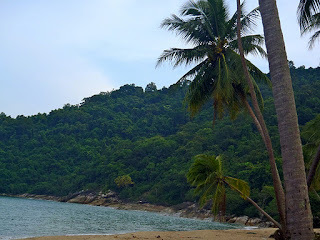 We went to a small secluded beach called Ao Thong Yee. It is beautiful and untouched and soon to be ruined. A local bar owner told me that the property was recently sold to a big developer. Maybe one day when I'm fabulously wealthy and the beach has been turned into a Four Seasons resort I'll be able to bore the life out of the staff with tales of the good old days. "I once pitched a tent where that woman is getting a massage--err, um, I mean a tent tent of course, before any of this was here. Another Mai Tai? I'd love one!" We did beach camping stuff during the day, swam, played Frisbee, drank beer. At night we collected drift wood, and palm tree logs and had a fire. It was an incredibly clear night -- the kind of night that makes you want to turn off all the lights in all the cities because it is tragic that we are ever robbed of all those stars. I had heard about the Phosphorescence at the local beaches, but had yet to see it. That night the water was as clear as the skies above and the Phosphorescence were glowing and tracing in streaks of bright luminescent blue. I was little kid giddy about it. People were talking to me, but I have no clue what they said. I was too busy doing underwater karate moves to flare the bright bright blue. I had breakfast at a great beach front restaurant the next morning. The scooter ride home was long and rainy, but a small price to pay at the end of a great weekend. Also, we found out you can rent a beach house for 2000 baht a month ($60). Someone's getting a beach house! Someone's getting a beach house! Also, I managed to get some book work done on the beach. Twelve journal pages worth. Multi-tasking like a ___________!